Whether personal or professional, maintaining relationships requires a good amount of time and effort. Just as with personal relationships, it is important to be mindful of the business relationships we foster on a daily basis. If you take your spouse for granted or fail to make them a priority, it’s not likely to pay off for your marriage. The same is true of maintaining client and associate relationships. If it is an important relationship that you want to keep for years to come, than a little appreciation and recognition goes a long way. This was the line of thinking that motivated entrepreneur Nina Meranus to start her online company SurprisesByMail.com in 2011, under the simple belief that “the world is a better place when people do nice things for each other”. In 2012, the small business saw a lot of growth as co-founder Andy Sheeks joined the team and the company grew to service all 50 U.S. states as well as Canada. In 2013, the company projects continued growth as they build their reputation as the go-to-site for personal and professional gifting. SurprisesByMail.com makes corporate gifting easy, inexpensive and it’s a great way to make a personal connection with clients. Thoughtfulness and small acts of kindness go a long way in building lasting relationships. Sending a thank you for years of service, congratulations at a company millstone, kind words during times of personal loss and suffering or even just to say “get job” shows your client or employee that you care not only about their business, but about them. The simple truth is that people like working with people that they like and the more you work at improving professional relationships, the better they will be. Small businesses know just how important good employees are – they are the lifeblood of your organization. SurprisesByMail is also a great way to show your employees how much their hard work is appreciated. 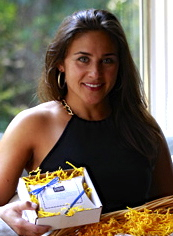 SurprisesByMail.com offers gift boxes that can be filled with your choice of goodies (like chocolates, fudge, baked goods, nuts, dried fruit, pretzels and even gift cards) and customized with a personalized message, image and company logo. It’s a great way to thank clients for a new customer referral, send appointment reminders or re-engage a stagnant or dormant account. SurprisesByMail.com allows companies an outlet for sending clients a visual reminder of their brand and how much their business means.